If you use the Billing Method By Total Hours you will set up a Fee Schedule and, optionally, a Multi-Student Discount. You can add and edit your "Total Hours" Discount Settings in Tuition Settings from the Tools menu > Edit Settings. Click +Edit Fee Schedule in the Tuition Billing Settings to create or edit your Fee Schedule. See The Fee Schedule (Tuition Billing Method By Total Hours) for full details. Click Update Now in the Update Total Hours Discount Settings section to select a Billing Cycle and set up discounts. If you don't see the +Edit Fee Schedule or Update Total Hours Discount Settings options it may be that your database is currently only set to use the By Class Fee Billing Method. These options are only available when you bill your classes By Total Hours. When you bill By Total Hours you can only use one Billing Cycle. Typically, Monthly is selected which means you bill monthly based on the number of hours a student or family is in class per week. 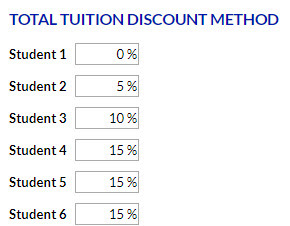 Select Use the discount rate listed for each student if you'd like Jackrabbit to apply the corresponding discount to each student's total tuition. 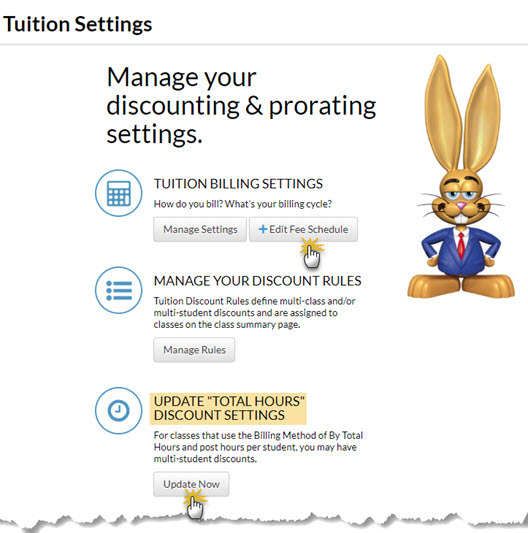 Select Add up the students in the family and use the discount rate listed for the total if you'd like Jackrabbit to add up the students in a family and use the discount associated with the total to apply to each student's total tuition . Specify the discounts for students one through six. The 7th student and beyond will use the discount defined for Student 6 (Six or more students). If you are using the discount rate listed for each student you will be asked In what order would you like to apply the discount?